Scrap This, Save That: Big News At MFP Speedy TV! Big News At MFP Speedy TV! Happy Thursday! We have big news over at MFP Speedy TV! The Scrapbook challenge has officially been changed to the COLOR CHALLENGE! So now, you have a choice about what you would like to make and enter. You can still do a scrapbook layout if you want..but you can also do a card or any other project. The guidelines have changed to colors now instead of the type of project you make. So for our first color challenge, we've chosen to work with the colors black, white and red. The idea is to predominately use any shade of the colors in the challenge although you can also use neutrals such as browns, grays, white, cream, kraft, etc. So I'll be totally honest...I was really having a tough time trying to figure out what to do with the stamp set I used this week. It's the new Family stamp set from Mark's Finest Papers. It's not normally something that I would consider to be my style, but it was a new release this month so I knew I wanted to at least try. So I took the two images and stamped them repeatedly in black Memento ink on off-white cardstock. 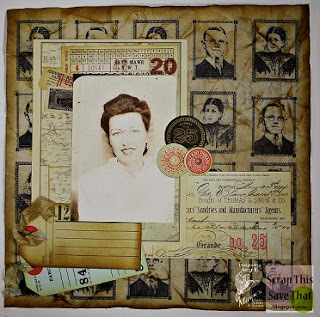 Once the images dried, I used tons of Tim Holtz Distress Ink in Old Paper and Vintage Photo all over the page. I spritzed the whole page with water and crumpled the whole thing up several times and tore some of the edges to distress it even further. Then I smoothed it out a little and used the Vintage Photo Distress Ink to highlight the creases by gently rubbing the ink pad across them. With my base page made, the rest of it came together pretty quick and easy. I had some pieces of vintage looking ephemera from an old kit, so I distressed them even further to match everything. 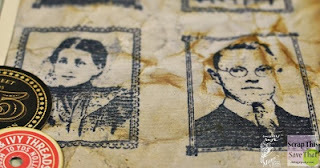 Then I remembered a print my daughter used in a project a few years back, that she had made of a very old photo of my grandmother when she was young. I haven't looked at the original in a long time, but I'm sure it was taken some time back in the 1930's. She was so young and beautiful. Of course I knew her when she was older so I don't even remember her ever looking quite like that. But I know it's her and it made this difficult-to-make page come to life for me. And now I love it. Please come join our brand new color challenge this week! Make a project, link up and have a chance at winning an awesome stamp! You have until next Wednesday at 5 pm PST to enter! Great job on your fabulous page. What fun to add your grandmother to it for completion. Beautiful scrapbook page - and the picture of your lovely grandmother is perfect. Lovely page and great use of the images. Time To Wrap The Presents!